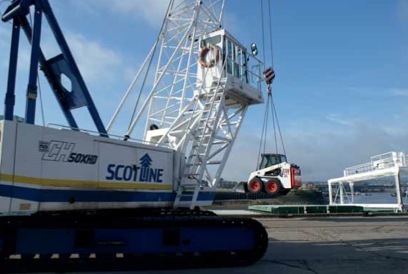 Scotline Ltd has purchased a new Bobcat S130 skid-steer loader from Bobcat of London, the authorized Bobcat dealer for London and the South East, for shiptrimming work at a new cement installation at Scotline’s Rochester Transit Terminal on the River Medway in Kent in the UK. The new cement installation provides cement for customers in the London and South East region and is an important diversification for the Scotline operations in Rochester where the company also runs the nearby Medway Timber Terminal. The Transit and Medway operations are two of four independent Scotline Timber Terminals in the UK alongside those at Gunness on the River Trent near Scunthorpe and at Inverness in Scotland. As well as cement, timber and wood pulp, Scotline handles other bulk cargoes and also owns and operates a fleet of seven modern box hold vessels. When a cement ship docks at the Scotline Transit Terminal, most of the unloading of the cement in the hold is carried out by a trailer-mounted extraction system on the dockside, which pumps cement from the hold via a new pipeline system to four large silos, from where it is loaded via a hopper into lorries for supply to customers. As the hold on the cement ship empties, there comes a point where the discharge tube cannot reach the corners and this leaves a significant amount of cement remaining in the hold. At this point, the Bobcat S130 skid-steer loader, which is equipped with an optional front door, is lowered by crane into the hold, where it first forms new mounds of cement in the centre of the hold for the discharge tube to extract and is then used to ensure that the hold is cleaned out as much as possible. Providing support for the new S130 skid-steer loader, Bobcat of London is the authorized Bobcat dealer for London, Essex, Kent, East Sussex,West Sussex, Surrey, Hertfordshire and Middlesex and is based in West Thurrock in Essex. Bobcat of London’s factory-trained engineers have many years of hands-on experience of repairs and servicing of compact and heavy plant and machinery. All the company’s service vans are fully equipped with workshop tools and extensive parts for on- the-spot service work. Only original Bobcat parts are used to maintain the best mechanical standards and to optimize performance, reliability and protect machines’ residual values. Bobcat of London stocks a full selection of genuine Bobcat accessories and parts to support every machine in the field and backs these with flexible service agreements including 24 hours a day coverage, depending on the requirements of the customer. In addition to essential spare parts stocked by Bobcat of London, there is a back-up service with overnight delivery for other items. For shiptrimming work such as that at Scotline, one of the most important advantages of Bobcat skid-steer loaders – their outstanding manoeuvrability in confined spaces – ensures they are the ideal machines for this application. In the S130 model, the radius lift pattern and short wheelbase are combined with differential steering for highly efficient manoeuvring and super fast cycle times in tight areas, a fast travel speed and more than ample auxiliary pump flow. In addition, the hydrostatic drive enables precise control of the speed and direction of the loader, both forwards and backwards, in any situation. The S130 skid-steer loader has an operating weight of 2,465kg, a rated operating capacity of 597kg and a tipping load of 1,195kg. The S130 also has a reach of 575mm with a lift height of 2,781mm. Enhanced performance results from the use of the Kubota V2203-E diesel engine producing 34.3kW of power at 2,800rpm. As well as Bobcat skid-steer loaders, Bobcat of London is also responsible for sales and service for Bobcat compact tracked and all wheel steer loaders, excavators, telehandlers and utility vehicles. The company also offers for sale over 70 different types of Bobcat attachments that help to deliver versatility and time- saving efficiency across a huge range of applications.